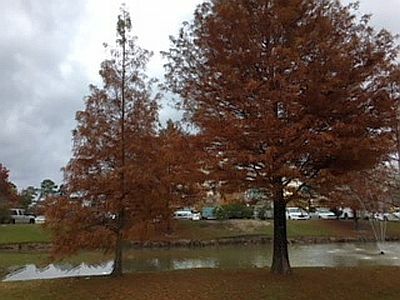 Taxodium distichum is the scientific name for Bald cypress. 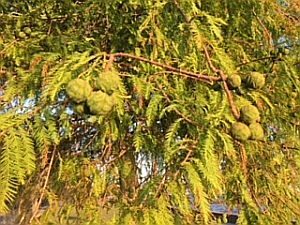 Bald cypress is a native southeastern species. It is the Louisiana state tree since 1963 and is a deciduous conifer in the family Cupressaceae that grows on saturated and seasonally inundated soils in the lowlands of the Southeastern and Gulf Coastal Plains and up the coastal plain to the mid-Atlantic states of the United States. Although many conifers are evergreen, bald cypress trees are deciduous conifers that shed their needlelike leaves in the Fall. They get their name “bald” cypress because they drop their leaves early in the season. Before they drop their leaves, they provide us with emerald green color in Spring and Summer, in Fall colors of tan/yellow, cinnamon, and fiery orange can be eye catching. The bark is brown or gray with a stringy texture. Young trees are pyramid-shaped, but they become a more irregular columnar shape in adulthood. The branches are often draped with clumps of Spanish moss. 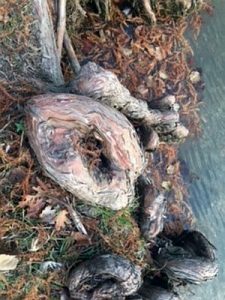 Bald cypresses are known for their “knees,” a special kind of root tissue known as pneumatophore, which means “air-bearing.” Pneumatophores form from horizontal roots just below the surface and protrude upward from the ground or water. Since bald cypresses often grow in swampy conditions, it’s thought that the pneumatophores function to transport air to underwater roots underground or to anchor the tree. The “knees’ are more prominent when tress are growing in wet conditions. They can be removed when undesirable in the landscape. Their cone structure is not cone shaped but round and about one inch in diameter. When cones appear in autumn, they are tough and green, but they become woody as the season progresses turning purplish in Summer and Fall. Each cone is made of a number of scales, and each scale is associated with two triangular seeds. Seeds are eaten by wild turkey, ducks, evening grosbeak, water birds, and squirrels. The seeds that escape predation are dispersed by floodwaters. Ever notice in the wild how a stand of Bald Cypress seems to be all around the same age? 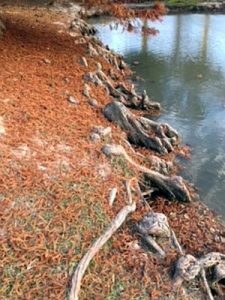 Bald cypress seeds do not germinate under wet conditions and will lie dormant for as long as it takes for water inundation before they remain wet for 1-3 months, once the water recedes, softened seeds are left buried in wet soil and begin to germinate all at the same time. Bald cypress wood is valued for its’ antifungal properties that is resistant to rot and shrinkage. They have been widely used to make fence posts, doors, flooring, furniture and more. In recent decades due to conservation efforts, they are harvested less for timber because they are slow-growing, and there are less of them than there once were. Another reason is these trees usually grow in wetlands, which causes difficulty for loggers. In the wild they resist strong winds even in marsh areas. Since they tend to grow along rivers and in wetlands, they are excellent at soaking up floodwaters and preventing erosion. They also trap pollutants and prevent them from spreading. Frogs, toads, and salamanders use bald cypress swamps as breeding grounds. Ducks nest in hollow trunks, catfish spawn in the submerged hollow logs, and bald Eagles nest in the treetops. A bald cypress tree will average a height of 50 to 100 feet and a spread of 25 to 30 feet when mature. It will grow an average of 1 to 2 feet per year in most locations. They grow fast in their first 7 to 10 years. The best time to plant is from November to March. Planting smaller trees of less than an inch in diameter is recommended for less stress on the tree. Plant at the same level it was growing in the container after digging a hole 2-3 times the diameter of the root ball. 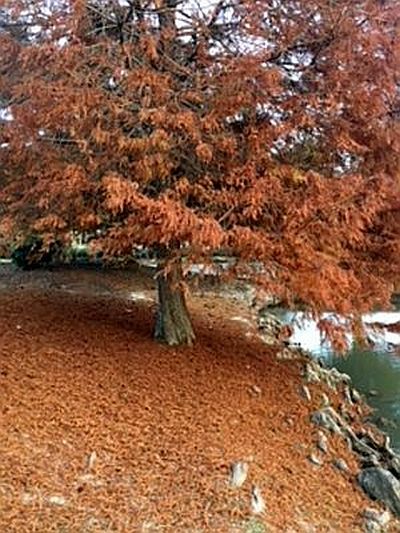 Bald cypress trees prefer acidic, moist soils but will perform well in a range of soils. They cannot tolerate heavily alkaline soils or extreme periods of drought when young. 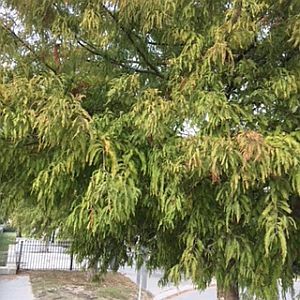 A bald cypress will mature more quickly when grown in fertile, consistently moist soil and when it receives maximum sunlight. Growth is moderate in drier soils/conditions or when soils are nutritionally low. Maintain a 3- to 4-inch layer of mulch around the base of the tree, keeping the mulch out from the trunk. This helps maintain consistent soil moisture and provides for the slow release of organic components to the tree’s root system. A newly planted bald cypress should receive enough moisture to keep the young root system constantly moist for 2 to 3 months. If rainfall is inadequate during this period, irrigate every 2 to 3 days deeply, soaking the soil out to the tree’s natural drip line. Do not fertilize a new specimen in the first year. A mature bald cypress will have developed a deep and complex root system. No supplemental irrigation or fertilization is needed for the tree to maintain a healthy rate of growth after it is a few years old. A few cultivars include, ‘Shawnee Brave’ narrow cone shaped, Montezuma’ has no knees, ‘Cascade falls’ weeping from. Growing up to 120 feet tall with a trunk three to six feet in diameter, bald cypresses are frequently referred to as giants. Bald cypresses are slow-growing, long-lived trees that regularly reach up to 600 years in age.